We know. You just stepped out of the shower and you came up with an idea for a mobile app that’s going to change the world. Well, maybe not the world, but it will at least make you lots of money. The only problem? You don’t know how to develop the idea. Sure, you could make a simple business app with the help of iBuildApp, but some of the features and tools you’re dreaming up in your head require custom coding, a skill that you’ve yet to master. I guess your brainchild is dead, right? Hiring a pro to make your app idea a reality is much easier than you think. You don’t have to go network at a bunch of development events or scrounge around Craigslist to locate a random developer with a shady past. The solution is still on the iBuildApp website, but you must go to the job listings page to share information about your project. It’s similar to how Freelancer.com works, except these pros are vetted and you won’t end up with someone who’s going to flake out halfway through. How do you go about hiring a pro for your job? Go to the iBuildApp website and punch in your login information. 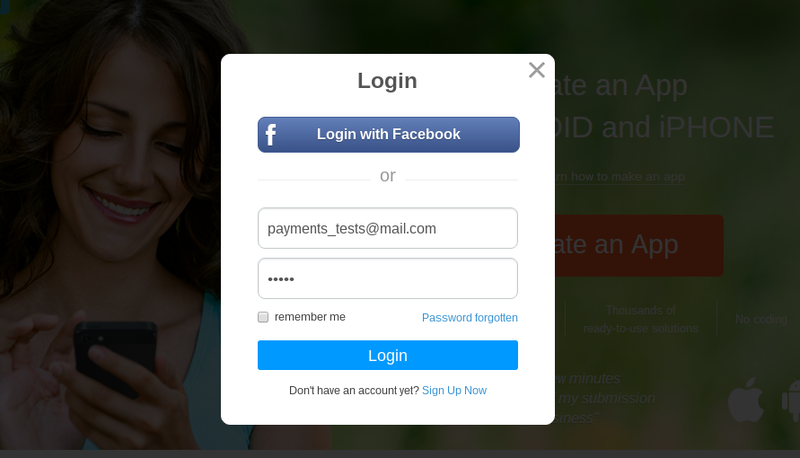 Click on the Login button to proceed into your account. If you don’t already have an iBuildApp account, feel free to create a new one with your Facebook page or your own user credentials. This will reveal a list of all the apps you’re currently manage. Click on the dashboard button to open up the editing page for the app you would like to hire a pro for. If you haven’t made an app yet, it’s required for you to at least choose a quick template and get started on a project before reaching out to a professional. The upper right hand side of the page reveals a big blue button. Click on the Hire a Pro button to get the whole hiring process started. Since quite a few developers will want to look at your job listing, you’ll want to be as detailed as possible. The goal is to get the most experienced developer for a reasonable price. You don’t want to scare away some good talent by not giving enough information. Therefore, punch in your first name, last name and other contact information. Specifying your website and industry come into play for the developer to decide whether or not their past experience is worthy of the current market you’re working in. Select whether you’d like to request app design, app creation, app submission or other services. Fill out the title of your project. This is the first part that people are going to see when viewing a large list of job listings. Make it stand out. Finally, the job description is the meat and potatoes of the whole job posting. Explain everything you have in your mind, and talk about how far along you plan on doing this project for. A timeline and pricing structure works well for reeling in the best people. After clicking on the Submit button your job posting is reviewed by the iBuildApp team. Once it’s cleared, you’ll be able to see it listed on the job board, which is revealed to a group of developers we have chosen to partner with. Any replies to your listing will be sent to your email inbox, giving you a chance to create a conversation with the person on the other end. App ideas are one in a million, so it’s not the worst plan in the world to at least test the waters and see how feasible a project is. There’s a chance that you mobile app project turns out to be super easy. On the other hand, discussing the job with a developer could help you understand that it’s a long shot project that will take forever. If you have any questions about hiring a pro through iBuildApp, please drop a line in the comments section below.